Rock bands used to be mysterious organizations. Fandom was an exercise in extreme patience. You whiled away the hours in monk-like private study of records, lyrics, and liner notes. A new song or video or interview hit like a scientist’s “eureka” moment, offering a new lens through which to explore familiar worlds more closely. But there were weeks and months where you heard nothing and pure enthusiasm and hope had to suffice. This was decades before bands sagely buttered all their favorite publications with access and exclusives come album time, before every inch of every performance was broadcast to the world across intersecting planes of social media. I miss the quiet of the ’90s sometimes, and I have a funny feeling a lot of working musicians do too, now that everyone feels the same icy pressure to inflate every album release into a multimedia event. It seems increasingly obvious that Brand New — the Long Island emo quartet turned inscrutable art-rock project responsible for both Alt-Press–core nuggets like “Sic Transit Gloria … Glory Fades” and the windswept, nihilist rock of The Devil and God Are Raging Inside Me — favors a bare-bones, old-school rock stardom. Brand New appears and disappears as it pleases. It no longer bothers with official merch or music videos. Tours and interviews are scarce. For a while now, singer-songwriter Jesse Lacey has been saying that his band’s days are numbered, but this month, a vinyl preorder for the long-awaited fifth Brand New album appeared and sold out in a blink, and lucky fans were blindsided with hard copies of the thing in the mail. 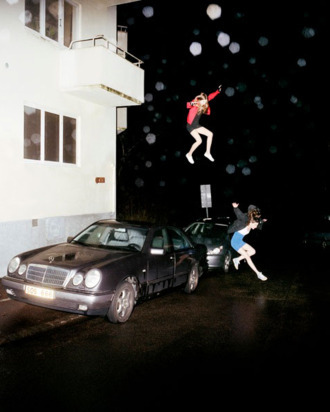 By week’s end, the new Science Fiction was available for purchase, closing the eight-year gap since 2009’s Daisy without a hint of what it means for Brand New’s present or future. This quiet, confounding uncertainty actually serves Science Fiction well. It is an album about lives in jarring flux. Like film director Brad Anderson’s grueling 2001 psychological thriller Session 9, Science Fiction uses what seem to be found recordings of psychiatric evaluations to project the horror of hallucinatory mental illness onto the listener, while Lacey and company dive into song after song about the psychic wear of survival in tumultuous late-teens America. For a band that steers as willfully clear of media as it does, Brand New is surprisingly adept at expressing the ambient terror and mania plaguing the times. The prescience of the fears haunting Science Fiction’s characters is as unnerving as their choices. In any other year — hell, any other month this year — Science Fiction’s gallery of druggies, atom bombs, and separatist militiamen would’ve read like, well, real-deal science fiction. But summer 2017 is a place where guys with guns tout full-fledged white supremacy, and the guy with the nuclear codes promise “fire and fury” to overseas enemies. The protagonist of Brand New’s “Desert,” a gun-toting, homophobic wing nut who thinks God commanded him to wipe out liberals, isn’t a far cry from the people on TV rallying in support of ethnic cleansing. The nuclear winter of “137,” a song literally named after a byproduct of decaying radioactive uranium, suddenly seems possible. The latter lyric is a bit of self-deprecating humor. The last Brand New album was a sullen expanse of death and sickness expressed by shrieking vocals and scabrous guitars. Science Fiction eschews Daisy’s fits and shouts for slow-burning five-minute workouts that carefully assemble a somber mood and blow it sky high with a crushing chorus. The grunge and classic-rock influences are unmistakable, especially in the quiet-loud Nirvana fan service of “No Control” and the lush, moody Vs.-era Pearl Jam balladry of “137.” These songs aren’t just mimicry or retro posturing, though; they’re more like Brand New working toward a new rock classicism for kids who grew up with the ’90s as far in the rear view as ’90s kids did the ’70s. Science Fiction doesn’t reinvent guitar rock so much as unite seemingly incongruous elements of it — acoustic grunge romps, psychedelic instrumental passages, progressive rock’s patient timing — into an impactful hybrid. It is impossible to say whether this album presents Brand New turning a corner and discovering new ways to express itself or dying young and leaving a sharp-dressed corpse. There’s a tour on the calendar for the fall, and no indication if there are any plans for this thing to continue past that point. For once, we’ll just have to wait and see.